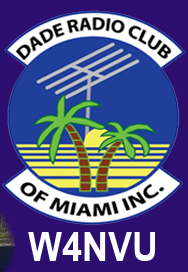 Technician Class – W4NVU – Dade Radio Club of Miami Inc.
An Amateur Radio, Technician Level, three day class is schedule at the Miami-Dade EOC on October 13, 20 & 27th, 2018 from 8:00 to 12:00. A Technician License will allow you to operate on frequencies primarily used for metropolitan area communications (and a bit more!). rest is curiosity and dedication. cost of the exam is $15.00. We will schedule a testing session on October 27th, 2018 at 1:30PM. Miami-Dade County Department of Emergency Management located at 9300 NW 41 Street in Doral. We will use a combination of these and other resources during the class. You are not required to purchase any one the above. I look forward to hearing from you and helping you obtain you License.